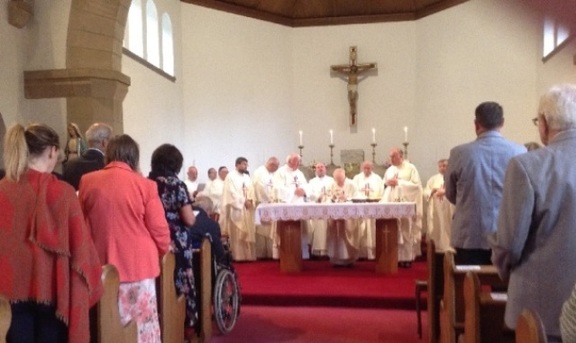 Sister Ishbel MacPherson, SND has just returned from Roy Bridge near Fort William in Scotland where she attended the Mass and reception for Mgr Tom Wynne's Diamond Jubilee and Retirement at the age of 87. 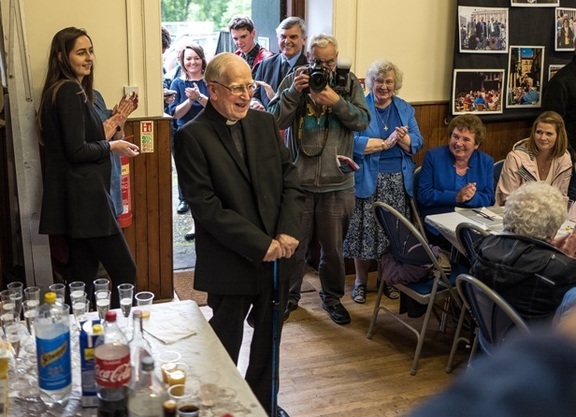 Mgr Tom was educated by the Sisters of Notre Dame at our school in Fort William before going to the seminary and he used to play the organ in church when Sr Agnes Bernard, SND, Head Teacher of the primary school, was away in the summer. He has always had a great affection for Notre Dame. Also in his church he has a shrine to St Mary MacKillop whose parents and family came from there. The Mass was beautiful with a full church and many priests including the present Bishop Brian McGee and the former Bishop Joseph Toal whose nephew, Sean, piped MgrTom from the church to the hall for a magnificent banquet. The organist at the church is Peter Rose, the composer who has produced Masses and lots of hymns/songs with Anne Conlon a former pupil of Notre Dame, Blackburn, Lancs. Peter's sister, Margaret Sargent, is also a former pupil of Notre Dame, Blackburn and her husband attended a Notre Dame primary school. Margaret was the organist prior to her brother Peter taking over. The Roses and Sargents all live in Roy Bridge all having a strong Notre Dame connection. Margaret had composed a 'This is Your Life' in verse form with power point presentation. She had also kept every weekly bulletin for 21 years and the children presented them in 6 huge volumes! There is a wealth of musical talent in that little village. A local 11 year old boy, Cameron MacIsaac, composed and played on his piano accordion a tune called Father Tom's Waltz and Peter Rose and Anne Conlon had produced a special hymn for Mgr Tom who was accompanied at the altar by his nephew and namesake, a permanent deacon. Altogether a great celebration! 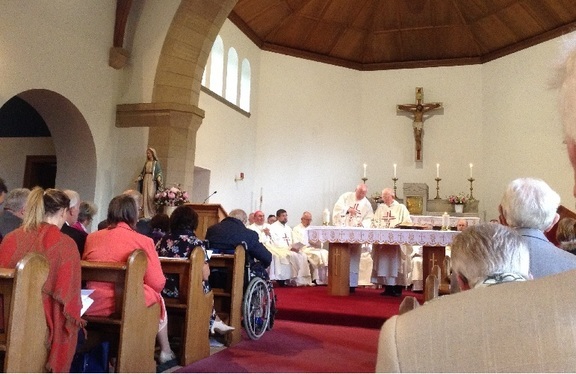 That the Parliament notes the diamond jubilee in the priesthood of Monsignor Thomas Wynne, who is the parish priest of Roy Bridge, Spean Bridge and Invergarry; congratulates Father Tom on his long and dedicated service to his parishioners; notes that he was ordained a priest on 15 June 1957 and has served in parishes across the Highlands and Islands in the ensuing 60 years, including in Dunoon, Kingussie, Oban and Morar; understands that a celebratory service was held in St Margaret’s, Roy Bridge, on the day of the anniversary, which was attended by the bishops of Motherwell and Argyll and the Isles, other clergy and many hundreds of parishioners, and wishes him a happy and fulfilling retirement.